I didn't write this one up. Only a couple people came, most of them dropping in at the end to paint. There was a program in the park. The week winds down....note to self, if teens are giggling at the drawing table check on them immediately...massive storm, very low attendance at Lego Club. Half day since I'm working Saturday. Smallest attendance ever )-: it's been a weird summer. My aides mostly ran it while I started putting together data and cleaning off my desk. Chronicles of Narnia. Can't decide if I should have second copies of these. They sit, sit, sit and then suddenly are requested. Oh, I am so torn on this book. It's a new edition of a classic set of stories, the books that inspired the Disney movie The Great Mouse Detective. I read and loved them when I was a kid and now they're back again! But will modern kids enjoy them? 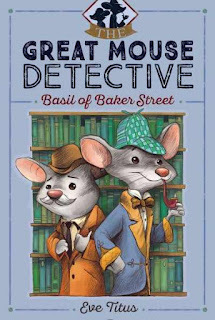 Eve Titus wrote these books to introduce children to the great detective himself, and Basil is clearly modeled on Sherlock Holmes - although he's a kinder and more friendly version. Basil has learned his craft at the feet of the great master himself, having moved himself, Dr. Dawson, and their entire town into the basement of Baker Street. 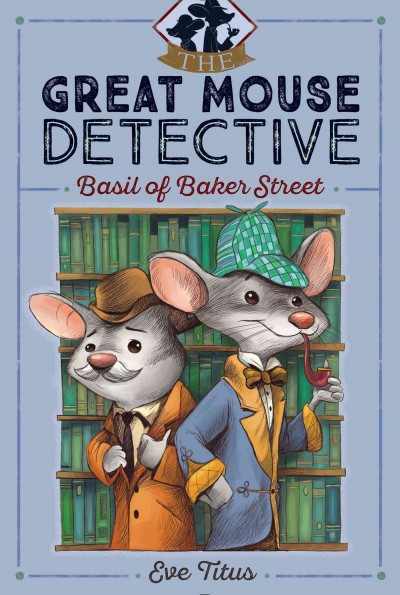 When white mouse twins Angela and Agatha are kidnapped, Basil puts to use all the skills and methods he's learned from the great Holmes - but will it be enough to save them from the dastardly plot of the Terrible Three? I was very happy that the publisher retained Galdone's original illustrations. The delightful black and white portraits show a miniature world populated by mice in the style of Holmes' Victorian time period. The flavor of the original language of Doyle's mysteries is woven throughout the stories in phrases like "Since he is a stay-at-home type, who has probably never been out of Mousecliffe, I deduced that he must depend upon the exploits of others for excitement. I won his good will with my imaginary adventures of the stout ship Pied Piper." On the one hand, these are classic, sweet adventures full of delightful turns of phrase and adorable mice. On the other hand, they retain all their original Victorian flavor - including remarks that are no longer palatable or appropriate. References to "natives" etc. In addition, while the book is of beginning chapter length, the vocabulary is more advanced. Verdict: I would put these into my unique category of "cozy read-alouds for young children." I have quite a few parents who enjoy reading chapter books aloud to their children and that is really the most suitable audience for these titles. The cozy nature of the stories makes them a good read-aloud without challenging children with the vocabulary and parents can skip over or discuss the outdated language as they feel is suitable for their children. I will admit that a certain amount of nostalgia plays a part in my decision, but as I do have quite a large audience for this genre I think I'm justified in adding it to the library. This sounded really good, but it took me a long time to get into it and I could never get really invested in the story or characters. Max Helsing, descendant of the famous Van Helsings, is putting his own stamp on the family business of monster hunting while trying to survive middle school and doing most of the work running the old apartment building he and his guardian watch over. He has a helpful sidekick, Syd, who likes to create gadgets and gear for him, and another possible sidekick in boy-genius Wing, his next door neighbor. 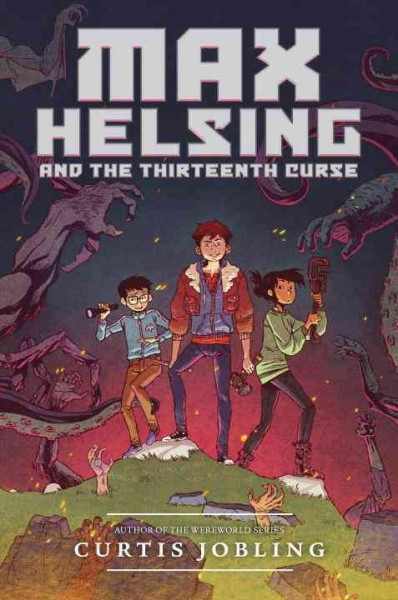 Unfortunately, between trying to be fair and give monsters a chance, deal with bullies, and train his new hellhound (he wanted a regular puppy) plus fighting a whole horde of bigger and more dangerous monsters than ever before, Max is up against some real trouble - and that's before he finds out about the curse on his thirteenth birthday! There's plenty of gore, monsters, and middle school hilarity, but the writing felt stiff and stilted to me. I was disappointed that, once again, girls and diverse characters are relegated to sidekicks and mentors, instead of being the main character. Verdict: This didn't click for me, but most other reviewers (and Ms. Yingling) loved the mix of action and gore and I agree that it will probably be popular. It just wasn't for me. This is an odd board book. 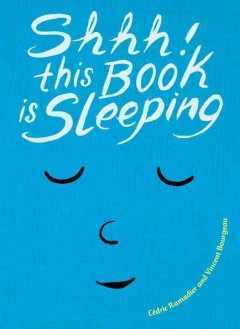 The cover shows a sleeping face, nearly lost in the blue of the book. The first spread shows a small, pink, mouse-like creature and features the book face with its eyes open. On each page, the mouse-creature asks a question - have you brushed your teeth? "Did you go pee-pee?" and the face answers "yes". The face grows sleepier as the rest of the bedtime rituals are gone through and finally you turn off the light, the white pages go dark grey, and the book sleeps. It's an interesting concept, but I am skeptical about a small child having the ability to think abstractly and A. realize it's a face on the book and B. connect that to themselves, since presumably the aim of the book is to send the reader to sleep. Verdict: Quirky, possibly a little too quirky. I'm trying to get my board book circulation up so I'm not getting any iffy purchases right now, just good, solid popular titles. If you're looking to expand your horizons a little though, this would be an interesting addition. Tiger Tales pretty reliably produces cute, colorful fare. Usually I pick their books to fill in gaps in the collection or for book-hungry toddlers, but every once in a while one comes along that stands up and yells "behold my cuteness!" and I do. A little mouse gets the fun started with some squeaky sounds and then all the animals join in with taps, tweets, hoots and more. But who's the real star of the musical show? Why, it's the hiccuping hippo of course, who started everything with her hiccup bubbles! Naughtier children will doubtless attribute the bubbles to *cough* another source, but toddlers will happily bounce along with the rhythm and giggle over the myriad of silly sounds. The vibrant, scratchy illustrations are the perfect background to this light and frothy story. Verdict: While I usually pick up Tiger Tales when I have some spare budget, this is one that will definitely be at the top of my order list. Recommended. I read this because I chose this for a book club. I chose this because I actually wanted another book. Let me explain! I really wanted to use one of Kathleen Krull's books from her new series, Women who broke the rules. 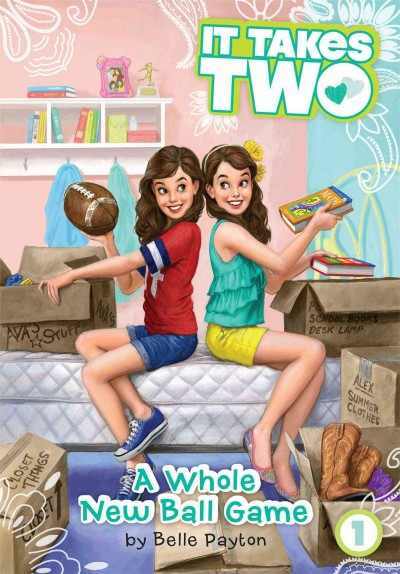 They're great middle grade chapter biographies, not too long, with pizzaz and interest. Unfortunately, they're just too new - not enough libraries have them for me to get a set for book club. So I scrolled through Krull's many other titles and picked this one, to be totally honest, rather at random. The introduction explains the varied reasons people explored the world and reminds readers that not all those explorations ended happily. Each explorer has a few pages, a map, and a caricature. 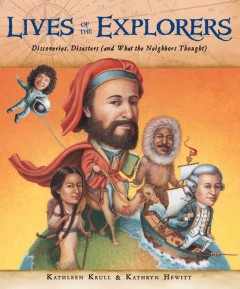 The featured explorers are predominantly the familiar white males - Marco Polo, Christopher Columbus, James Cook, Daniel Boone, Richard Byrd, August and Jacques Piccard. But the line-up does include more diverse choices; Ibn Battuta, Isabella Bird, Mary Kingsley, Matthew Henson, Zheng Che, and Sally Ride. The brief biographies give just enough information to get a good idea of the person's character, highlights of their lives, and inspire readers to research more. In the profile of Zheng He, "Chinese commander of seven voyages to thirty countries" we learn a little about Chinese history, the legends that formed around Zheng He, and see on a map his remarkable accomplishments. Mary Kingsley "English explorer of little-known parts of Africa" is presented in all her complex life, from her refusal to support women's right to vote to her adamant opposition to organized religion and her support for the rights of native tribes. The story of August and Jacque Piccard introduces the reader to a family of scientists and explorers and we learn how their inventions and discoveries influenced both their family and others, from Jacques Cousteau to cartoonist Herge. The book ends with a spread of "more pioneers of space exploration" included Mae Jemison, Guion Bluford, and a list of sources for further reading. 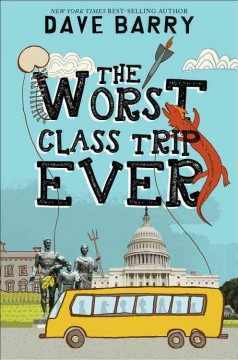 Verdict: Reluctant readers may be more willing to pick this up than a more "standard" book on exploration. Krull is witty, brief, and informative and the short chapters will allow them to pick and choose stories to read. The caricatures are very similar to the popular "who was" series and will also gain interest. On the other side of the coin, it's difficult to get kids to pick up nonfiction that looks too much like a picture book and this will need some booktalking. Still, I'm glad I chose it for my book club. Sports books! I am not a sports fan and really don't read this genre, but I certainly buy them for the kids. I have kids who will read only sports novels, but they are not really voracious readers so I find a few basic series is quite enough. This week coincided with Farm Technology Days in our county. Take a moment to google it and you'll see it's a HUGE deal. A lot of our staff were there (I took one look at "50,000 people" and "record heat" and volunteered to hold down the fort at the library....). I am feeling very meh about taking pictures of anything that is not my garden. In which we have a long discussion about the ethics of killing bees who are by our book drop. Except they turned out to be wasps/hornets, which we all were ok with killing. Mostly. Pearl the reading dog was under the weather (probably literally - who would be a Great Pyrenees in the summer?) and so we cancelled that program for today. I got most of the program plans for this very busy week finished and we hashed out more things we need to discuss for the fall. It was a full moon. This is a warning to me not to do programs I'm not fully invested in...I felt like I needed at least one more "techy" Maker Workshop and picked this because I've done it before. Well, the first thing was that the supplier I usually use for the brushbots, Maker Shed, was out. I should have cancelled the program then. Instead, I ordered them from a different site and had to limit attendance because I had fewer kits. Then I suddenly realized these kids needed batteries. I really dislike doing things that are so limited and I should have remembered that. This was very popular and I *might* do it again next year, but I will purchase more kits and be better prepared. gymnastics, olympics - all the new stuff i bought is gone already! Fly Guy fans get ready - Noodleheads have arrived! Mac and Mac are noodleheads. Literally. In four short chapters they have some crazy dreams and nightmares and come up with their own solutions for those dreams. First, they sleep outside so they won't have to make their beds - but they have a nightmare and their legs get all tangled up! The next day, they have a contest with their friend Meatball. Whoever has the best dream gets the apple pie! But Meatball has a trick up his sleeve.... Bedtime rolls around again and the Noodleheads have a pillow fight... and lose Mac's pillow! He tries some substitutes, but just gets nightmares. Fortunately, the Noodleheads have a solution for this - and for never having to make their beds again! Notes at the beginning of the book explain the folklore origins of the tales, which will be of interest to adult readers and teachers. Kids will just have fun laughing at the hilarious antics of the Noodleheads - and maybe get introduced to some fun folktale motifs! 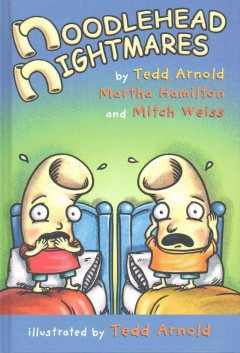 Arnold's trademark bulgy eyes and cartoon characters are a great fit for the foolish stories of the Noodleheads and their nightmares. The art has a scribbly background, which reminds me of Alison Jay's cracked eggshell designs, and gives an interesting texture to the art. The story is arranged in comic panels with bold white dividing lines, large text, and speech bubbles that are easy to follow. Verdict: Fly Guy fans will be delighted by this new title, hopefully a series, and it makes a great introduction to simpleton/noodle stories. Recommended. London is agog with fear and speculation about the mysterious master thief, the Ruminating Claw. 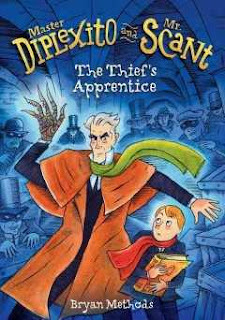 Oliver Diplexito is more interested in convincing his father he's not a coward and to take some interest in him, but when he gets a shock late one night and realizes the Claw is none other than his father's butler, Mr. Scant, he starts to take a much closer interest! Oliver is soon caught up in Mr. Scant's mysterious world and dramatic story; he gets taken along on some nerve-wracking expeditions as an apprentice, learns about some of Mr. Scant's ingenious machines, and goes up against a dangerous organization who are the real thieves of England's treasures! The descriptions of the various characters are vivid and the whole story has a Dickensian air. It's also a decent length, coming in at less than 300 pages. However, the story is rather rambling and confused and it's not a particularly fresh plot. Readers are unlikely to sympathize or relate to the neurotic Oliver or the eccentric Mr. Scant and the action doesn't really take off until partway through the story. Verdict: Fans of secret societies and adventures will be better served with more popular titles like 39 Clues, Infinity Ring, or Seven Wonders. The story does have a flavor of Roald Dahl, but not enough to ride on the popularity of the new movie. Purchase only if you have truly dedicated Anglophiles and fans of Dickensian children's literature. I don't think I've ever had a patron ask for any books in Mandarin, but this looked really cute so I wanted to take a look anyways. 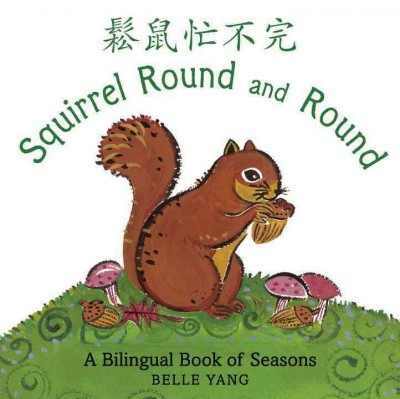 Each page features a simple descriptive sentence of spring with the Mandarin phrase on the opposite side. The language is lovely and includes some more difficult vocabulary, "Spring turns to summer. Watermelons grow sweet on the vine." Some things that may be unfamiliar are included; camellias, yellow watermelons, cicadas, and persimmons, a great opportunity to teach kids some slightly more difficult words. The paintings are created in gouache. They have thick outlines and rich colors. There is enough detail to hold a reader's interest, but the pictures are blocky and large enough to be easily seen by very young children. The squirrel is in each spread, making a fun seek and find activity. The last spread has an explanation of tonal marks and the Chinese characters repeated with their pronunciation. Verdict: Even if you don't have an audience for board books in Mandarin, this is a delightful seasonal board book with lovely art and text. Recommended. 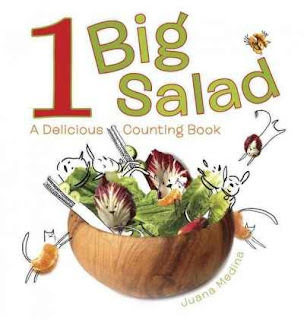 Foods with personality aren't a particularly new idea - Freymann and Elffers have turned out quite a few vegetable personalities - but Medina brings a charm of her own to this counting book. Verdict: While younger children may not recognize all the vegetables and creatures, they will enjoy counting and learning the different words. Older kids may be inspired to create their own vegetable creatures - you may have trouble convincing them to eat them though! I look forward to adding this to our collection of titles used in healthy eating programs. This is a little different from the nonfiction picture books I usually get excited about and I have some concerns about the accuracy, but it would be great to spark a discussion with kids. 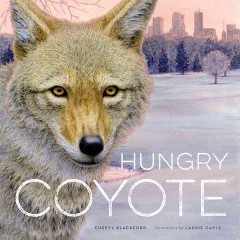 The story follows a male coyote through four seasons. It begins in the cold winter as the coyote hunts for food under the snow. Next comes spring and the coyote mates and has cubs, still hunting for food in the ponds and woods. In summer there is more food to be found both in the wild and in the urban areas the coyote moves through; he and his family enjoy a treat of stolen sausages. Finally, fall arrives and winter returns. A brief informational note discusses how coyotes adapt and live in both urban and rural environments. The big draw for me is the lovely artwork. Caple's rich illustrations show the coyote's quiet integration into urban life as he slinks through the fields, across bridges, and by roads. The effortless detail not only gives an accurate picture of the coyote's behavior but also parallels it to human life, as he watches humans interact with the seasons as well. There are also different things to find in the pictures, like the vole the coyote is hunting or the soft whiteness of falling snow. My main issue is with the text. It feels as though it is struggling to be poetic but only ends up sounded forced. "Coyote skulks until everyone leaves. He drools, darts, and snatches." or "Near the shore, water birds snooze in feathery flocks. Shaggy shadows stalk, bounce, and pounce." It's not exactly poorly written, it's more that it would make a difficult read-aloud to wiggly children because of the wordiness and while I enjoy teaching kids new words, there are too many unfamiliar adjectives to dump on them all at once. My other concern is factual - the coyote who is the main protagonist of the story is clearly male. He dens with his mate, hunts for the pups, and then takes them out to teach them to hunt. That didn't sound right to me; a quick search informed me that while male coyotes may hunt for and regurgitate food for their pups, the female doesn't allow them in the den and they do not stay together as a "family". Also, the female teaches the pups. Of course, I'm not an expert in coyote behavior and they are very adaptable, but females, not males, teaching pups to hunt and survive is fairly common in animal life and I found it exasperating that the author chose to...give the coyotes' traditional gender roles? I don't know, maybe I'm overthinking it. I would like some fact-checking and more sources listed though to justify this. Verdict: I loved the art, not so much the text. This is a small press title and therefore more expensive, but the lack of materials on coyotes makes it a strong purchase for my library. If I used it in storytime we would probably discuss the pictures though and skip most of the text. I won't wholeheartedly recommend or not recommend this; I feel like I don't know enough about coyote behavior to accurately judge. The fifth week. Halfway through summer reading, only three weeks left of full programming. It's busy. I'm exhausted. Chapter books about diabetes. I really don't have anything - and don't know if anything even exists, besides Sugar Isn't Everything. Kelly, author of the Ballpark Mysteries series, is back with another great sports-themed beginning chapter book series. Five friends are getting ready for their elementary school's olympics. There's archery, races, gymnastics, and more. But there's also someone who doesn't want the olympics to continue. Can the five friends solve the mystery of who is sabotaging their games before someone gets hurt? Kelly does a great job at mixing sports and mystery together. There's a combination of information on the sports; how the archery works, descriptions of races and gymnastics, and coverage of other games as well. There's also plenty of hunting for clues with taking fingerprints, examining handwriting, and making deductions. The author and illustrator together have included a good mix of diverse characters. The five friends include two girls, both of whom enjoy athletics, two African-American kids, and at least one boy with darker skin and another who might be Asian-American. Their race isn't clearly defined, but they are clearly depicted with darker skin and hair. I also appreciated that the kids on the cover included those with darker skin and there's equal time given to the different characters in the book, rather than relegating some to sidekicks. 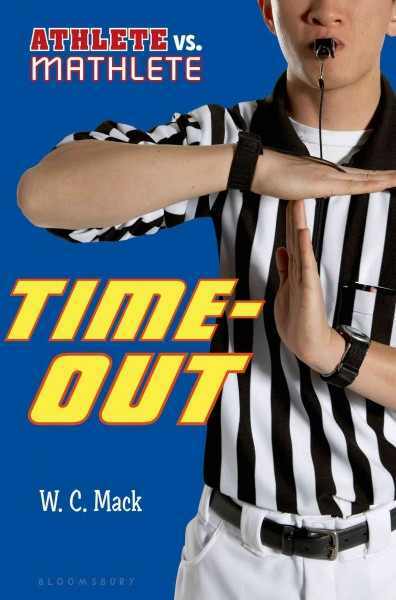 Verdict: Mystery and sports fans will be delighted with this new series which is sure to fly off your shelves. Highly recommended. I'm struggling to get through a major slump in my middle grade reading, so this took me two or three tries to get into it, but once I'd fairly started it was funny and spot-on perfect. Wyatt, awkward eighth grader, is on his way to Washington D. C. for a class trip. He's not really interested in history, he's more worried about not embarrassing himself in front of his crush, Suzana. Unfortunately, this is not as easy at it sounds - not when he's stuck with wacky Matt as his best friend. Especially when Matt suspects the two men in the seat behind them of being terrorists. And things just....get out of control. To Wyatt's surprise, he gets his wish to spend time with Suzana; although he'd pictured something more romantic than being kidnapped, chasing suspicious characters around Washington D. C., and crashing - literally - the White House! Wyatt and his friends are hilariously true to life, from Wyatt's wish to be cool and tall to his awkward friends. There's a healthy dose of wish-fulfillment, fart humor, wacky adventure, and dodging teachers as well as political intrigue and throwing forks. There's casual references to Wyatt and his friends' diversity and I'm happy to add this to my my store of funny books featuring Hispanic characters. Verdict: This is a sure hit with middle grade and middle school kids. I recommend it to 5th grade and up and it's a perfect summer read, funny, relaxing, and pokes gentle fun at the foibles and farts of kids and grown-ups alike. It flies off the shelf at our library and the sequel is looking to be equally popular. Highly recommended. Segal is the author of the popular Carrot Soup and this is a board book edition of a title that came out in 2011 and is now out of print. A plump, pink pig is determined not to take a bath. After all, pirates never take baths and she is a pirate! But, her mother reminds her, pirates don't get seasick and she does! So, she decides to be a cowboy, a knight, an astronaut....and one by one, her mother finds a less-than-positive aspect of her choice. "It's hard to poop and pee in zero gravity" and while it's true there's no water in the desert for bathing, there's none for drinking either! Finally, she decides to be a treasure hunter and her mother knows just where she can find treasure; in the bathtub! Segal's soft and silly watercolors illustrate this quirky story and the small pig's determination to avoid a bath at all costs and her mother's equally determined stance to talk her into it. 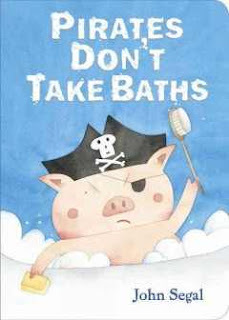 It's sweet, funny, and very relatable for kids (and parents) who dread bath time. Verdict: Although I like this story, I don't think it makes a really good board book. Each page has multiple small illustrations and sections of text and the soft watercolors could be difficult for very young children to decipher. I hope the publishers will bring this back as a picture book, because it's a delightful book, but it makes a much better picture book than board book. I have long adored Julia Denos' lovely illustrations in picture books and chapter books and now, finally, she has her own book. Appropriately enough, it is an exuberant celebration of color. Swatch is a wild girl who lives in a place of wild colors. She tames the colors and teaches them to do magical things but one day she captures Just-Laid Blue in a jar. Soon she is capturing all the colors and it's only when Yellowest Yellow makes her stop and think that she remembers the colors are even better and more wonderful when they are wild. Denos' language is simple and lovely, but it's really secondary to the gorgeous, stunning, exuberant COLORS. 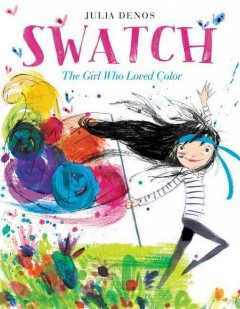 Swatch's messy black hair, tamed with a splash of color that can work as a mask, cape, or hairband, captures her wildness. And the colors...oh the colors. I can hardly find words to describe them. Dozens of colors, splashing across the pages, filling jars, exploding across the page, exploding into barely-formed images, swooping like birds....you just have to read and love it for yourself. Verdict: A little long for a storytime, but perfect to accompany a program on colors, paint, or just to read and pore over again and again, enjoying the lovely art. In the early 1920s air travel was still a dangerous novelty. When a group of military pilots and mechanics set off to circumnavigate the globe, they met hardships and dangers from hostile nations to severe weather and mechanical issues. However, they survived and completed the flight, becoming heroes not just of the United States but of the world. Their journey had barely begun when one plane of the group crashed in Alaska, barely surviving their adventure in the freezing cold. Rival fliers faced difficulties of their own and yet another plane from the American group was lost in the dangerous air and water currents off Iceland. However, they finally made it home to become heroes - and usher in a new age of flight. 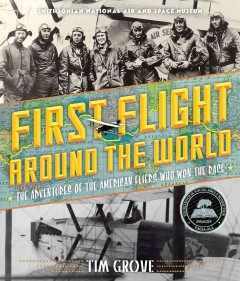 This book details their flight, including dangers, accidents, and the excitement of seeing new places in an entirely new way. Photographs, first-person accounts, and other source documents fill the book as well. It's a riveting story as you follow the fliers through exhaustion, unfamiliar cultures, and various perils. The story also includes mechanical details and context from the history at the time. Verdict: This is a fascinating read and even though it's a little more expensive than the average narrative nonfiction, I think it's worth the price. 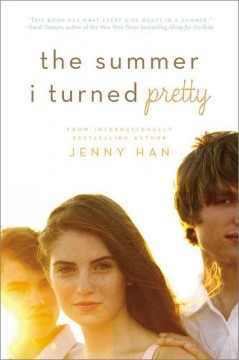 It would be a great title to booktalk for the summer. Recommended. I really like this clay turtle. Some definite talent! I took a day off, because my mom was visiting. I took another day off! My staff did Lego Club. I did not enquire too closely into what else happened. 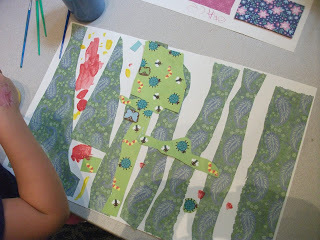 I came in the afternoon to run the maker workshop, see what chaos had eventuated in the past two days, and do the sleepover, with help from my staff. There were 20 people at the sculpting workshop (which I have not written up yet - basically we did Sculpey). We did a mystery for the stuffed animal sleepover - Kevin the Minion was kidnapped by a Laura doll and she tried to ransom him for library cards. All ended well and I got home by 9! Magic animal friends - where is Lucy Longwhiskers? Who names these things? lexiles. who needs lexiles in the summer?? This quirky beginning chapter book isn't ideal for a library collection, but it's so fun I simply must find a way to use it! You, yes YOU, have been recruited for a dangerous mission. Wait, you aren't the new agent? Too bad, you're in anyways. Fortunately, Carl the Duck (and your own imagination) are here to guide you. Once you've signed the oath (and drawn a cool cat with sunglasses) you're ready to begin. As the comic story progresses, there are multiple pauses where the reader is instructed to draw or write, favorite places or foods, a space suit, bridges, and more. With your help, the mission ends successfully, Carl gets back his top-secret jar (it had peanut butter in it) and you're ready for another mission! 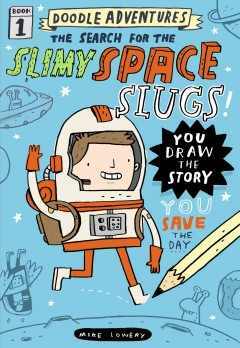 Lowery's cartoon illustrations are wacky and fun and will encourage kids to try their own doodles and comics in the spaces provided and beyond. The book has an orange and blue color scheme and a tongue-in-cheek sense of humor that fans of Captain Underpants fans will enjoy. Verdict: But....you're meant to write in it. A lot. Realistically, this isn't a book you can put in a library. I mean, I wouldn't even buy Battle Bunny because one pencil, crayon, or marker mark will breed more. I have seen it and it is true. However, this is a delightful, silly, and imaginative effort. If you have the funds, multiple copies for a book club would be delightful. Or, possibly photocopying the interactive pages and reading it out loud in a program while the kids follow along. I will definitely be trying this out at some point in the future! I was skeptical but hopeful about this book when it was promoted by a publicist at BEA. I was excited about a book featuring a boy who is Hispanic, but doubtful about the audience for a coming of age story - usually it's girls who go for this genre. Mateo is having a tough year. His best friend Johnny Ramirez doesn't hang out with him anymore, his parents gave his old trike to his annoying little sister, and, worst of all, he's just seen a pair of TALKING SKUNKS steal the trike! 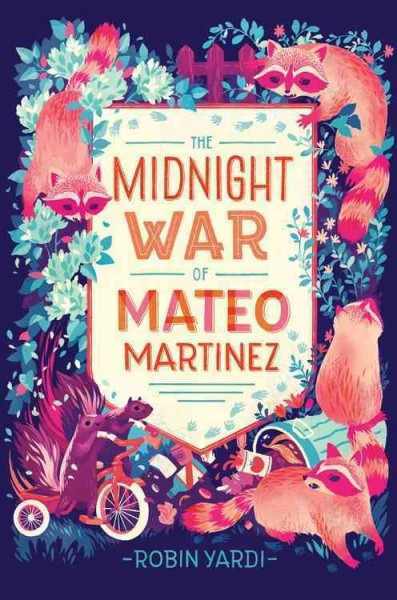 Mateo tries his best to live up to the knights in his books, but it's hard to be brave and noble when he gets blamed for things going wrong and his ex-friend is hanging out with a bully and is now ganging up on Mateo and his new friend and....it's just too much. He'll have to make difficult decisions, navigating friendship, identity, and para-military skunks to get his life back on track. Mateo is a realistic character in that difficult tween stage - sometimes he acts more like a little kid, not wanting his sister to have his old trike, and sometimes he's got more mature concerns. He reflects on his identify as a Mexican-American, the nature of territories and friends, and his adventures with the skunks bring out thoughts on how people interact - and how wars get started. 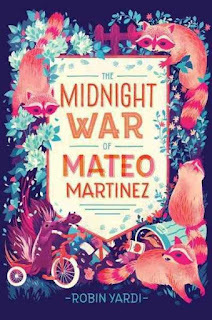 There's a light, fantastical touch in the talking animals, humor in Mateo's inner dialogue and battles with the furry miscreants, and more serious aspects as Mateo struggles to adjust to changes in his life and relationships and decide which friends deserve his loyalty. Verdict: I enjoyed reading this and it's a sweet and unique book. 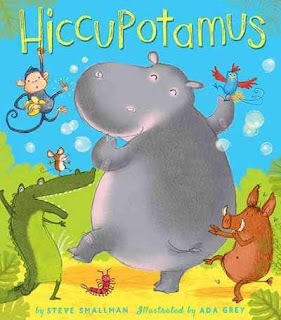 I don't think I'll have a wide audience for it, but I do have a set of more sensitive boys around this age who will appreciate it and some careful booktalking may introduce it to a wider audience. 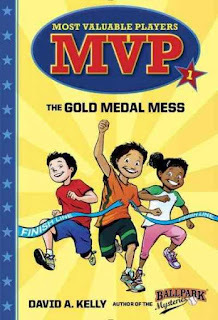 It will definitely fill a gap in the collection for books featuring diverse kids and addressing issues of friendship and change for younger tweens. I think I'll use it in book club next year, if I can find enough copies. I don't know how I missed that this was a board book - I thought it was a comic book. Well, it sort of is, but in board book form. 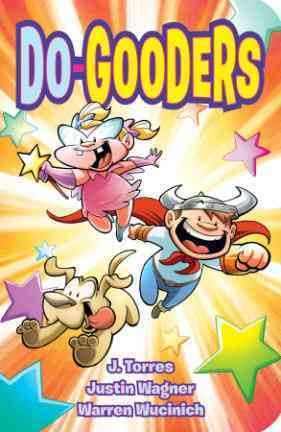 Each tall page features a scenario with the kids from the cover - fighting over superhero capes, teasing each other, etc. and then learning to be "good" and play together. They learn to share cookies, solve a fight with a hug and other simple social behaviors. The book ends with a spread showing lots of different do-gooders, all with home-made costumes, painting houses, recycling, helping a cat down from a tree, raking leaves, etc. The book is a tall rectangle, 10x6 inches, with 10 stiff board pages. It's mildly amusing, but not an ideal board book - the arguments and plot are a little too convoluted for a small child to follow and the pages are busy. From an adult perspective, I wouldn't want to encourage kids to feed a dog chocolate chip cookies!! or give them ideas of naughty things to do, which pretty much any kid will take away from this book. It's also a tad too stereotyped for my taste. The art is colorful and busy, with a collection of pudgy and enthusiastic children. Only the last spread shows any diversity. Verdict: If you have a lot of very young superhero fans that are willing to consider non-canon superheroes and parents desperate for role models, this is a perfectly fine addition. If you're looking for beginning comics for your littlest listeners, stick with Jennifer Holm's I'm Sunny and I'm Grumpy. 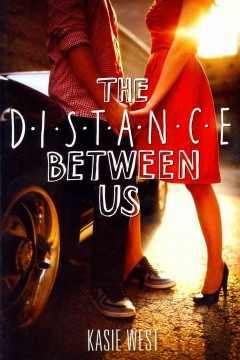 This was a simple, sweet book that I fell in love with. These are often midlist titles that make up the bulk of our collections - they don't win awards and may not be outstanding or even memorable, but they create warm memories of reading together and may just be a childhood favorite for a little one. Ella has stickers and Penguin is thrilled. But they're not ordinary stickers - they're glow-in-the-dark stickers! There's just one problem; they have to go in the dark closet to see them glow! 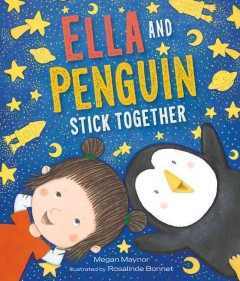 With Ella's help, will Penguin be brave enough to venture into the dark closet and see the stickers glow? The simple, comic illustrations are delightful and though the story doesn't have any wild excitement or uproarious humor, there's a gentle, sweet feeling to it that will reassure listeners while making them giggle along with Penguin's worries. Verdict: Perfect for a storytime on the dark or stars, be prepared to break out the glow-in-the-dark stickers to go along with this story! Of course, now that my school system no longer does the big annual biomes project, all the awesome biomes books are published. Sigh. This title is part of a new series from Bearport, "Nature's Neighborhoods: All About Ecosystems." It begins with a quick introduction to the idea of a habitat and ecosystem. Pond plants, animals like muskrats and ducks, and insect life are all covered. The book also includes microscopic life, the life cycles of various pond dwellers, and concludes with the babies mentioned previously grown and ready to start a new cycle. Each page includes numerous tidbits of information, captions, highlighted vocabulary, and lots of cool photographs. Back matter includes a sample food web, picture glossary, brief index, two titles about frogs and dragonflies, and a link to an online resource through the publisher. Verdict: Even if you have a lot of biomes books (I do) this is a great introduction for younger children or struggling readers. 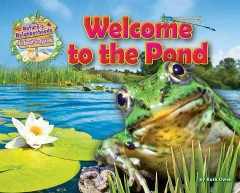 It's a handy overview of the various creatures and life cycles of a pond and will get readers started either on a research project or just interested in the world around them. Recommended. This is basically read-alikes for Simone Elkeles' Perfect Chemistry. We had to re-evaluate the open garden program - the garden has not gotten to the point where we can safely offer a program. So now it's "come help Ms. Jess with the garden" time! We had 165 people at Storywagon. I am re-evaluating our summer programs and outreach. I realize that's a weird reaction, but this is the thing - more than half of those people were school groups. Do we need to gear our offerings more towards school groups? We could do this, easily, with a few small changes. Do we need to change the way we do outreach? Summer reading registration is, I am fairly sure although I have not counted, down. I think the community is changing - more people in school, daycare, on vacation, in sports, etc. and we need to change with it or our summer programs will die. Or it could just be the weird schedule the school had this summer and if we stick with a reliable starting date regardless of the school, all our problems will be solved....Lost track of time and went home late. Good program, busy all afternoon. This summer is just so...discombobulated! I want to hide in my office and do collection development! Making vast amounts of slime for two hours cheered me up, not least b/c I got to watch my staff help out and they simply loooove slime. Mwa ha ha ha. The kids are doing an "Explore Elkhorn" class - I took them on a tour of the library from the oldest part to the newest, talked about how things change, and we even visited the basement! They wrote and drew pictures about the library yesterday, today, and tomorrow and then got to play in the puppet theater, sign up for summer reading, and explore the children's area. I had a good group for carpentry. It was a very long day. My feet hurt. We talked about glue, pre-drilling holes, etc. but I wanted to keep it as simple and hands-on as possible and encourage the kids to problem solve and plan on their own. Also, I did not have time for all that. I am working to keep these truly "maker" activities, not just crafts the kids put together. Did the kids get frustrated and need help? Yep. I am ok with kids being frustrated - I find myself frequently swooping in to alleviate the slightest waiting, impatience, or frustration and that's just not healthy. There were a few things I would change - our hammers were too big and I think a different kind of nails would have worked better and also a workbench instead of sitting on the sidewalk in the sun! - but overall I think it was successful. Argh, I simply cannot get the board book circulation up! It was always averaged around 400, but last December it dropped to 200 and I haven't been able to get it up over 300 again. I need to brainstorm this. Read-Alikes for Angleberger's Rocket and Groot book - some questioning turned up DK Adventures superhero books were what they wanted. Most reluctant reader I have ever had has been hooked on Dragonbreath. SCORE. I wonder if we really need that many Cupcake Diaries books and then they get checked out in giant armloads and other kids come in and are very sad they are all gone. Adults are starting to look for Harry Potter. In her fourth adventure, Anna Hibiscus is finally taking her long-awaited trip to Canada, to stay with her maternal grandmother. Anna thinks she is completely ready and her family is sure they've given her all the things and advice she will need, although her mother looks a little worried over some of their advice! But when Anna arrives and meets Granny Canada, it's not quite what she expected. She couldn't possibly have imagined such cold, and everything is dull and gray. Her granny lives alone, a big shock for Anna who is used to living with a big family and many relatives. Worst of all, Granny Canada has a dog. Grandfather warned her that people in cold countries have dogs inside their houses, but Anna didn't believe him. Dogs are filthy, sick animals that bite. How could you have such a thing in your house? And just when Anna thinks she may have met some new friends, who will teach her to play in the snow, they tease her and say she's not good at skating because she is from Africa. However, with the help of Granny Canada and her own optimistic spirit, Anna overcomes all difficulties. She learns to love the snow and cold, to be friends with Qimmiq the dog, and to change the prejudices of the Canadian children she has met. Soon, Anna will be just as sad to leave cold Canada as she was to leave her beloved Africa - but she'll be taking a new friend back with her! 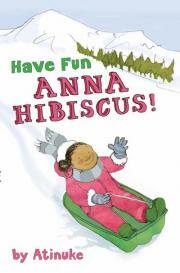 This is another wonderful addition to the story of Anna Hibiscus. We've seen her world from her point of view - now we see a whole new culture through her eyes. The prejudice of the other kids may seem simplistic, but it's a very simple age - and their responses are completely believable. It's a look at a culture most children are familiar with from a very different perspective and plenty of warm and happy adventures are included. Verdict: This is a wonderful series to add to your series collection. After a while, most beginning chapter series seem to run together, but never Anna Hibiscus. Every story keeps the strength and familiarity of the characters while opening up a new world to the readers. Highly recommended. Revisited: I love these so much. But, sadly, I simply cannot get them to circulate. These type of slice-of-life beginning chapter books only seem to be of interest to parents looking for read-alouds for their young children and no matter how much I try to promote these, they simply don't circulate. I haven't weeded them, but it's probably only a matter of time. Hopefully they will find a happier home in other libraries. ISBN: 9781610670081; Published March 2011 by Kane Miller; Review copy provided by publisher; Purchased for the library.